There are some spoilers ahead. You are warned. Michael Connelly you disappoint me. I’ve been a huge fan for the past fifteen years. I have read every novel. There is something compelling about your primary protagonist Harry Bosch. And yes, there is a dark side to him. This is not new. He has his demons that go back to Vietnam. That go back to his mother’s murder. He has his mission. “Everybody counts or nobody counts.” I get it. In recent years, the Bosch novels have exhibited a disturbing trend. Michael Connelly has continually pushed Harry in ways that reflect nothing more than the actions of a corrupt cop; a police officer so driven by his personal sense of justice that the law — the constitution — just does not matter. The ends justify the means. I’ve found myself getting more and more frustrated. I am not going to create a comprehensive list here, but this is not new. No warrant for a search? No problem? Need to get a confession? Threaten the suspect. It has always bothered me. I teach constitutional criminal procedure, and try to drill the need to respect the rule of law into my students. I try to convince my student that the Bill of Rights are just as important as the criminal law. I know this might be somewhat idealistic, but Harry Bosch, no matter his flaws, was always one of the good guys. 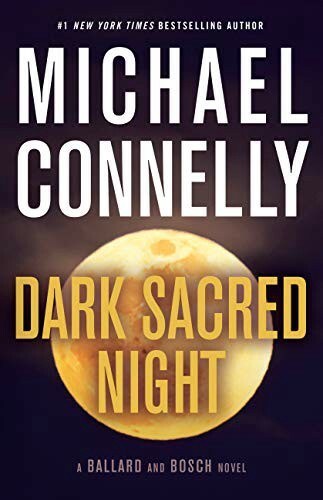 The latest Bosch novel, Dark Sacred Night, which isn’t really a Bosch novel per say, but a Renee Ballard and Harry Bosch novel, takes my concern to a whole new level. Ballard was introduced as Connelly’s new misfit detective in last year’s The Late Show. In Dark Sacred Night, Ballard and Bosch team up to solve a 9 year old cold case. I absolutely loved 90 percent of this book. The two characters jelled. There was no underlying tension between the characters like in so many other of his books. The interaction didn’t involve high jingo. No one from LAPD had it in for Bosch. The story was compelling, and interesting. Then Connelly had to ruin it. Spoiler alert. Minor (and perhaps major) spoiler follows..
Renee Ballard is interviewing a individual in his apartment. She gets a hunch that he is hiding something. So she does the right thing, and calls a judge asking for a telephonic warrant. The judge denies her request. There just wasn’t probable cause. My first reaction was “yes!” Then I turned the next page. Ballard hangs up the phone, and immediately goes back to the apartment, knocks on the door, and claims she left her flash light in the missing person’s closet when she was in the apartment. The suspect goes to look, and she immediately starts conducting an illegal search. Oh, but her hunch was right. So all must be ok in the world. No, no it isn’t. She conducted an illegal search. She broke the law. She violated the defendant’s rights. She was lazy and took the easy way out rather than doing more investigative police-work. Fast forward to the main story when she follows up on a lead, and decides not to wait for a warrant (again), and instead goes off on her own, in the middle of the night, and breaks into a warehouse. She committed a crime — criminal trespass — in order to investigate her hunch. Then she gets caught, but fear not, Harry is there to save the day. And then tells her to get lost, as she was never there. Alone with the suspect, Bosch takes action n order to get a confession, In doing so, Bosch comes one step short of torturing on the suspect. A coerced confession, in the same league as that done by disgraced Chicago Police Lieutenant Jon Burge, whose CPD goon squad routinely tortured suspects to get confessions. You know, the guy who attached an electrode and a battery to a suspect’s testicle. That will make you talk. Bosch doesn’t go quite that far, but it’s close. For him it is sulphuric acid. Then after getting his confession, Bosch first lets the parent of the murdered girl know where his daughter’s murder is, so he can exact his own justice — with a chain saw. BUT Harry then has a change of heart, and places an anonymous call to the LAPD, who arrive just in time. Harry Bosch has become no better than all of his worst antagonists. He is now as corrupt as Former Deputy Chief Irvin Irving . He is no better than Lewis and Clarke of IAD fame. Or his former partner Frankie Sheehan. Harry Bosch has devolved so far, and so low, that he has become no better than the individuals who are usually his prey. Bosch has become a criminal. Bosch and Ballard might be claim to be righteous. And they might believe that “everybody counts or nobody counts” (no, that one liner is not used in Dark Sacred Night). But they both violate the law as a matter of course, and in doing so, become proponents of what can only be considered vigilante justice. And then they agree to work together, “only bending” and “not breaking” the law in the future. Yeah, I’ve seen that before. Michael Connelly is a great writer. His novels are generally compelling. But he has turned his star protagonist into a criminal. And after several books with similar “bends” in the law, it is clear he is perfectly fine with that. Connelly is free to develop his character however he likes, but I am free to say enough is enough. I have dedicated a lot of time and energy into a character that I first read in 2002 in City of Bones. I’ve read all the books, most twice. Yet, Connelly can’t get a free pass for making us — his fans — think that that Harry came close to the edge — but he didn’t cross it. Yes, yes he did. And so did Renee Ballard. What makes this worse, is that I loved 90 percent of this book. I thought Bosch was back and there was a bright future for someone in the hey day of his career. Then there was that that other ten percent. That ten percent which makes me question whether it is worth continuing to read Bosch novels. Michael Connelly could, and should do better. His fans deserve better. We live in a world where police abuse of force is a real problem. We live in a world where the actions of real life cops have significant impact on police-community relations. I am not saying Harry or Renee need to be saints. I am not saying that Connelly shouldn’t portray then as real cops who face the dilemma of how far to go, in accomplishing their tasks. But when we glorify their regular illegalities, we are doing no one any favors. Heck, Connelly doesn’t even have them even question most of their actions. It’s not entertaining anymore. Maybe it is time to retire Harry. And rethink Renee Ballard. Michael Connelly, your fans deserve better. And really, so does Harry.